Happy holidays! We’ve been hard at work on some new features, planning for the next year, and writing a bunch of blog posts. Lets dive in! 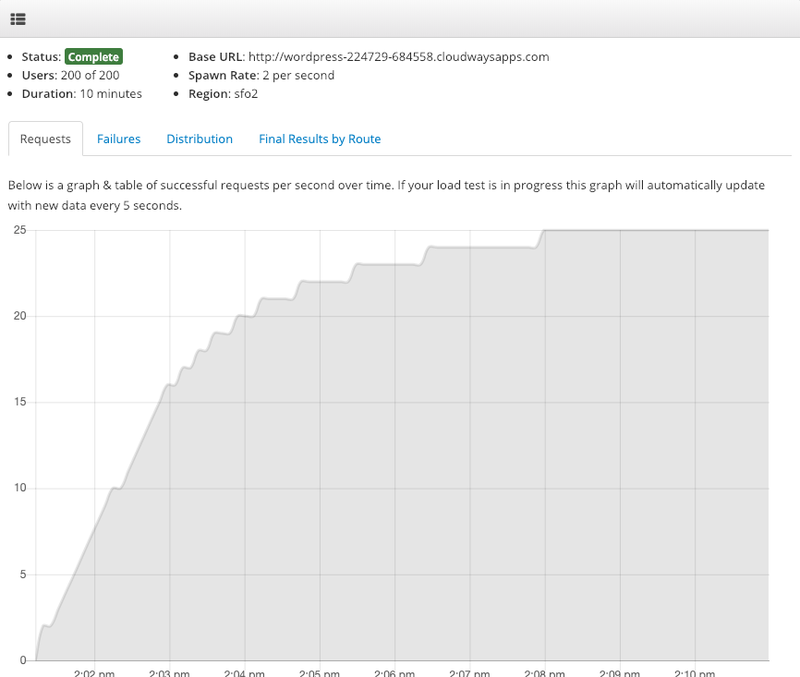 In case you missed it, we launched the closed beta of our WordPress Load Testing service. Most of the feature work has been around addressing feedback that we’ve gotten from our beta users. 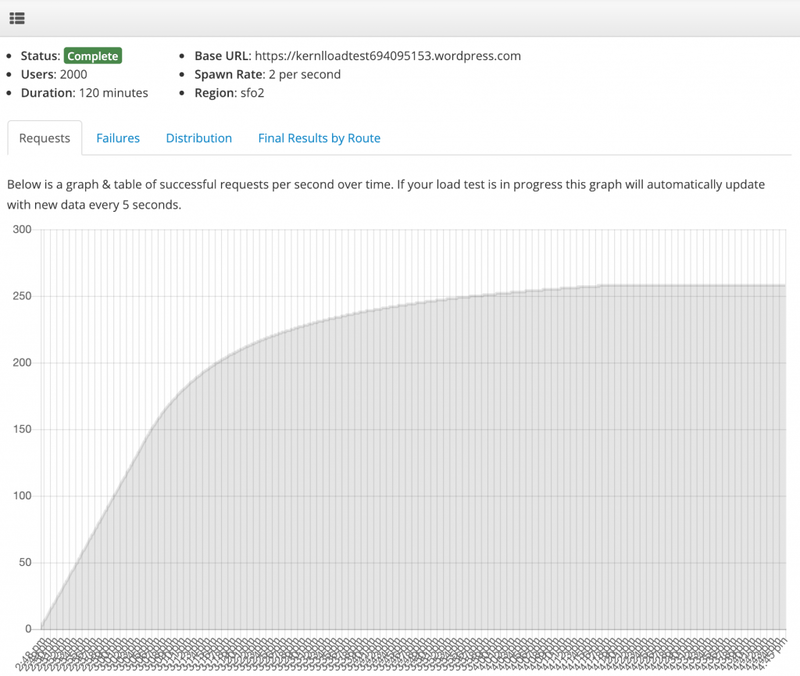 Repeat Load Tests – You can now repeat a load test with the click of a button. 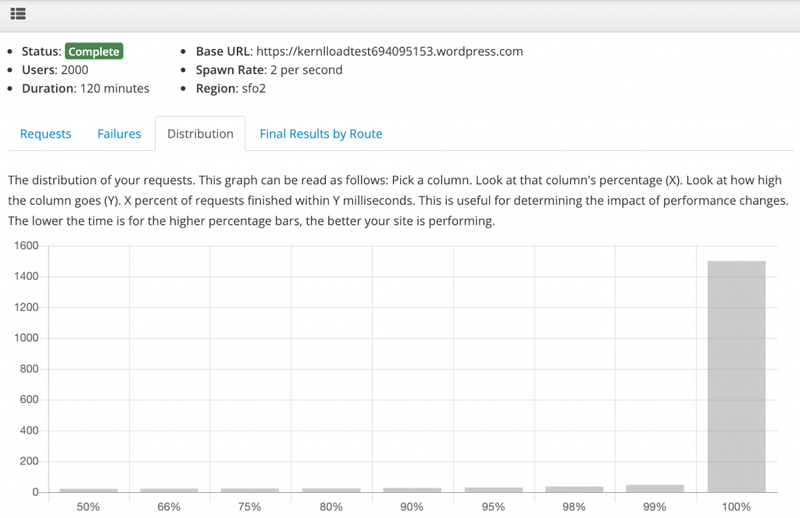 User Request Rate – The user request rate is now configurable. You can tell Kernl how often each user should make a request. IP Addresses & Traceroute – Each load test now has information about the IP addresses of the load generators that were used as well as a traceroute from the load generator to the domain under test. 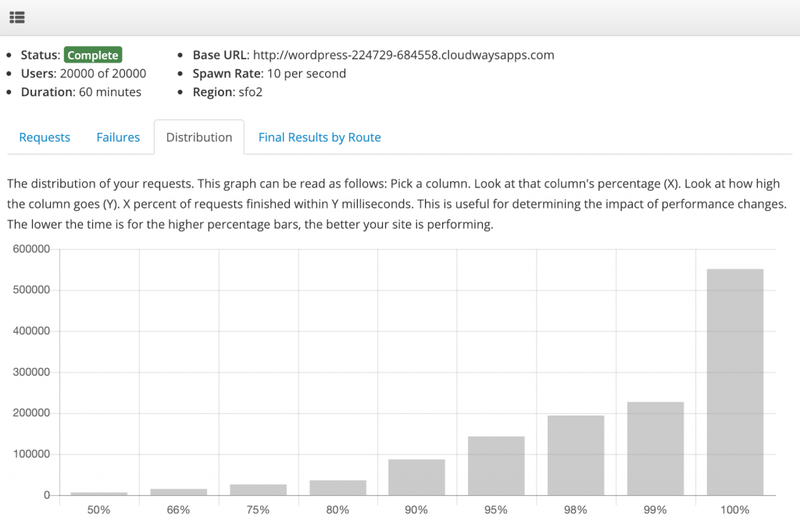 Unified Graph – The requests per second and failures per second graphs are now unified and share the same graph. Site Layout Fetching – Site layouts are now fetched on the backend. 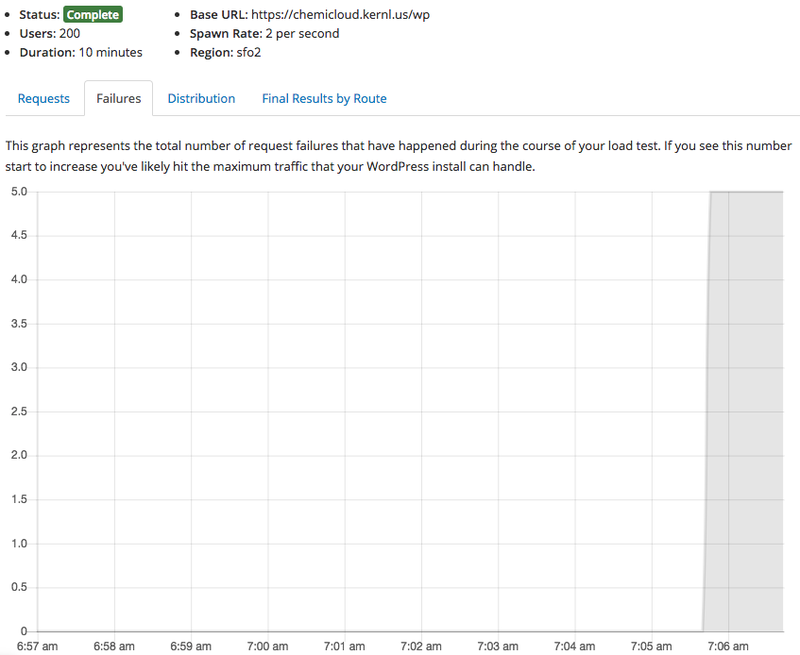 CORS headers were causing some issues when Kernl was making requests from the frontend. 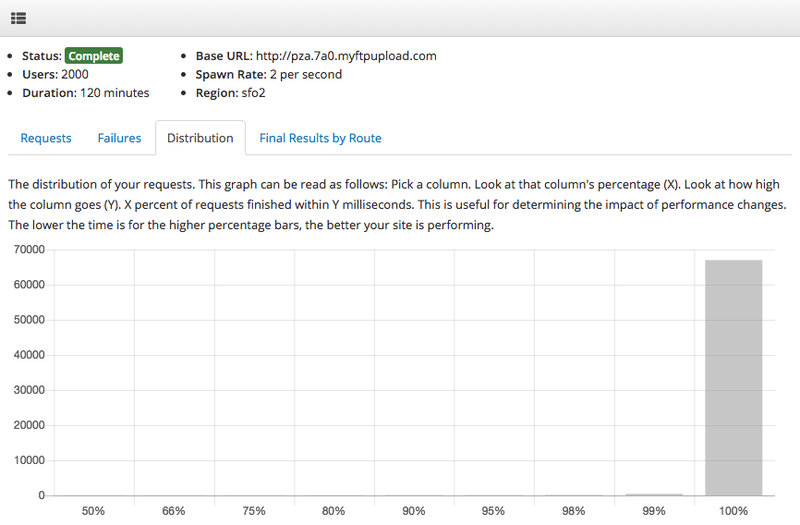 Manual Routes – You can now add routes manually to your load test. Complex Queries – GET, POST, PATCH, and DELETE queries are supported. You can configure custom request bodies as well. Email Validation – We’ve validated our domain through our provider so emails are less likely to be flagged as spam. 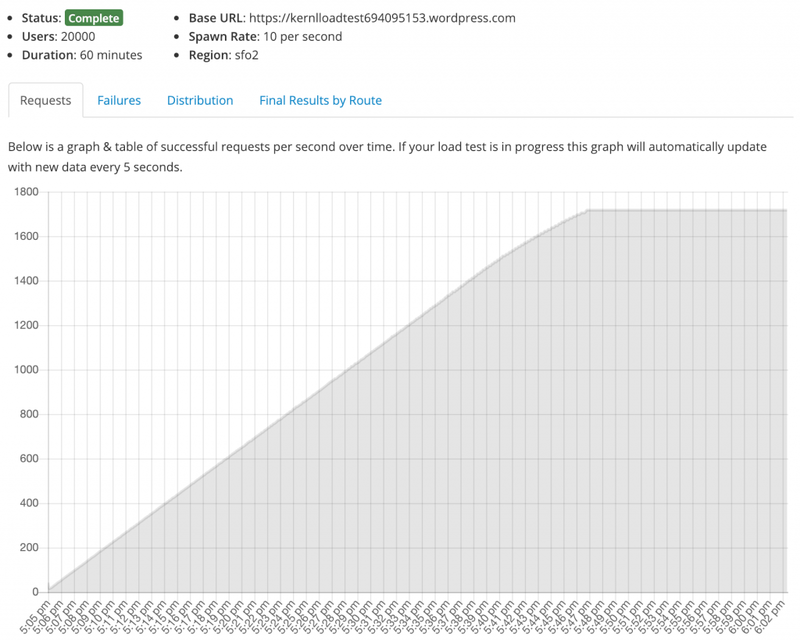 Our blog posts from this month revolved around load testing. Thats it for this year! We hope that you have had a great 2018 and hope your 2019 is even better! 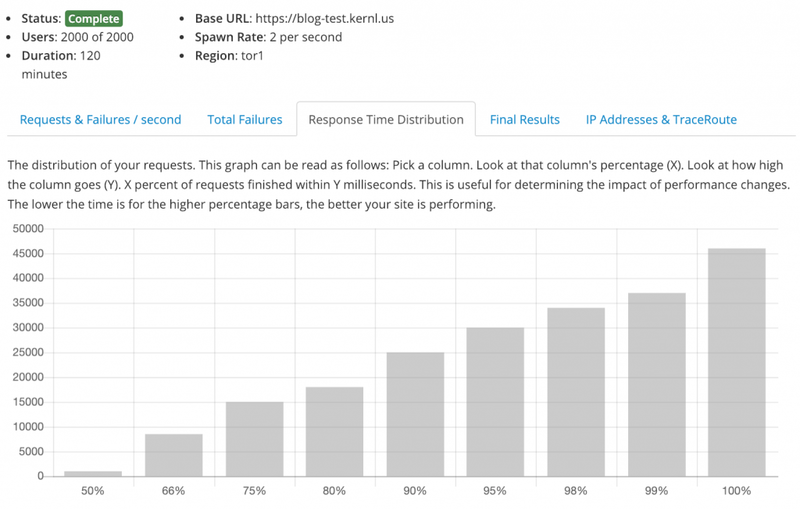 At the beginning of December Kernl launched a closed beta for our WordPress Load Testing service. 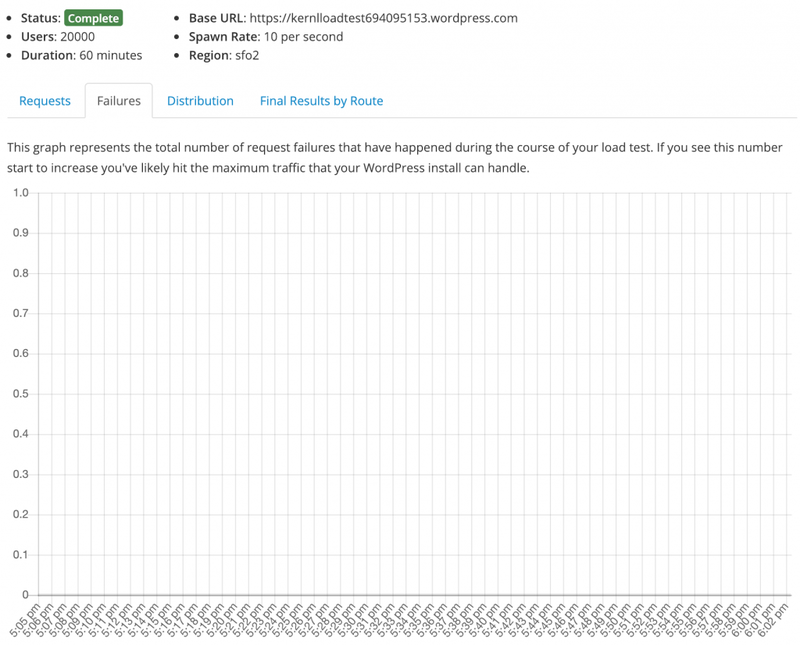 As part of the bug shakedown we’ve been spending some time load testing different managed WordPress hosting services. 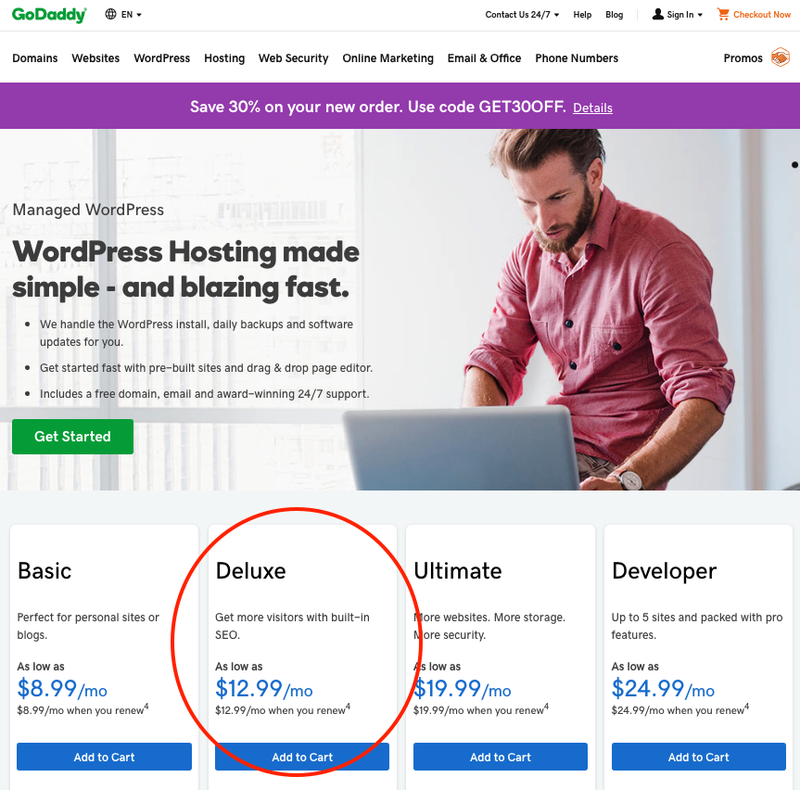 Some of previous tests include WordPress.com, CloudWays, and GoDaddy. 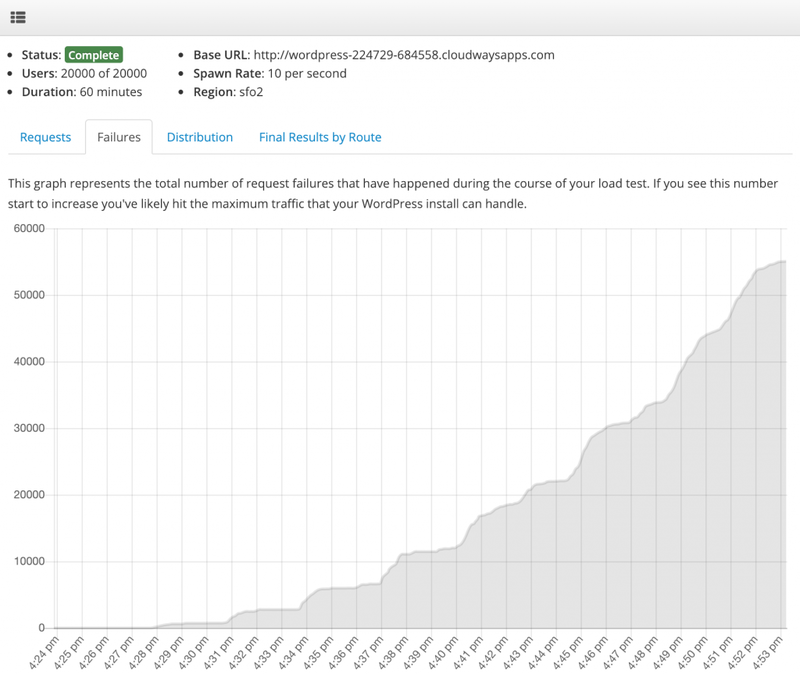 For this test, we turned our sights on ChemiCloud. 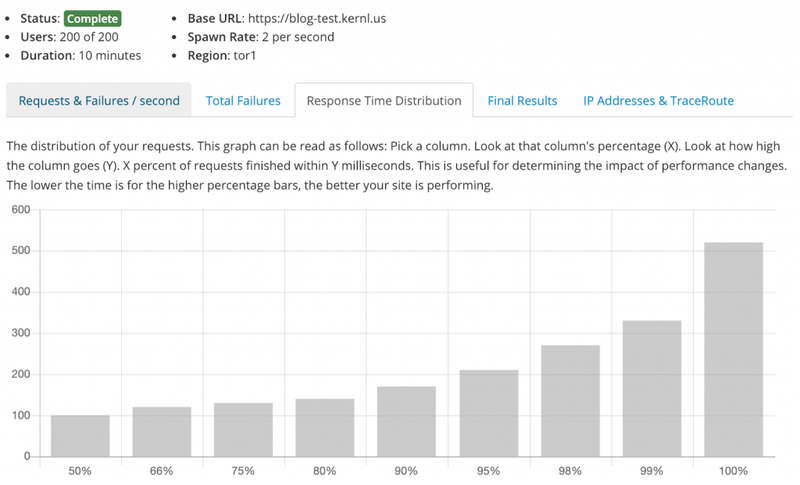 Using Kernl’s load testing feature we run 3 different load tests against the target system. 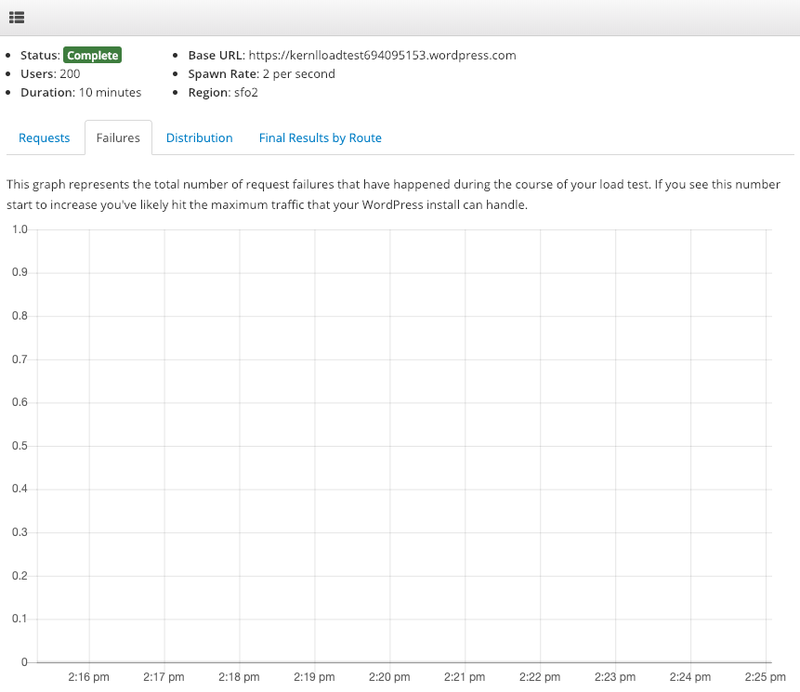 The Baseline – This is a simple baseline load test that we use to verify that our configuration is correct and that the target can handle even minor traffic. It consists of 200 concurrent users, for 10 minutes, ramping up at 2 users / second, with traffic originating in San Francisco. Sustained Traffic – The sustained traffic test mimics what traffic might look like for a read-heavy website with a lot of visitors. 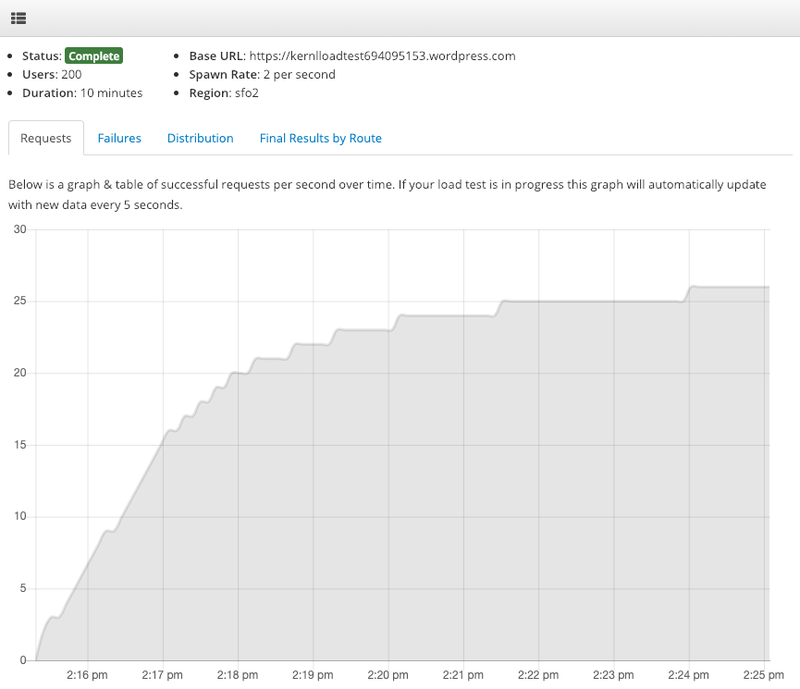 This load test consists of 2000 concurrent users, for 2 hours, ramping up at 2 users / second, with traffic originating from San Francisco. 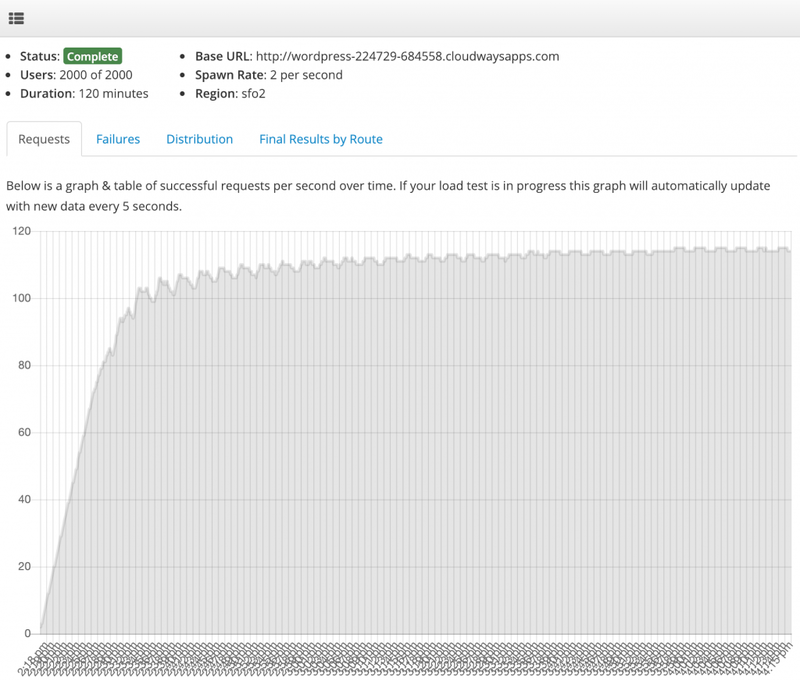 Traffic Spike – This test is brutal. 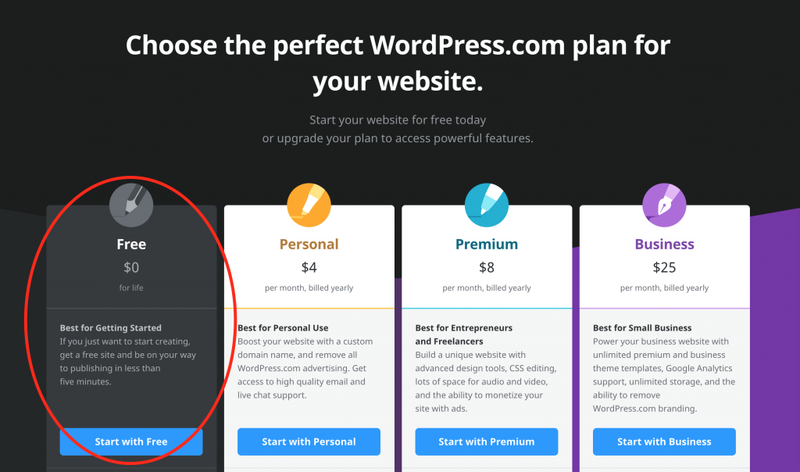 We use it mimic the sort of traffic that your WordPress site might experience if a link to it were shared by a Twitter or Instagram celebrity. 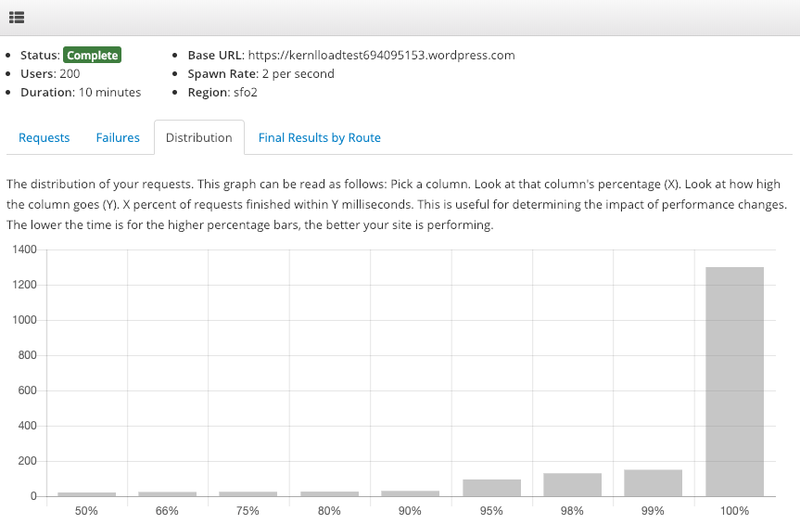 The load test consists of 10,000 concurrent users, for 1 hour, ramping up at 10 users / second, with traffic originating from San Francisco. 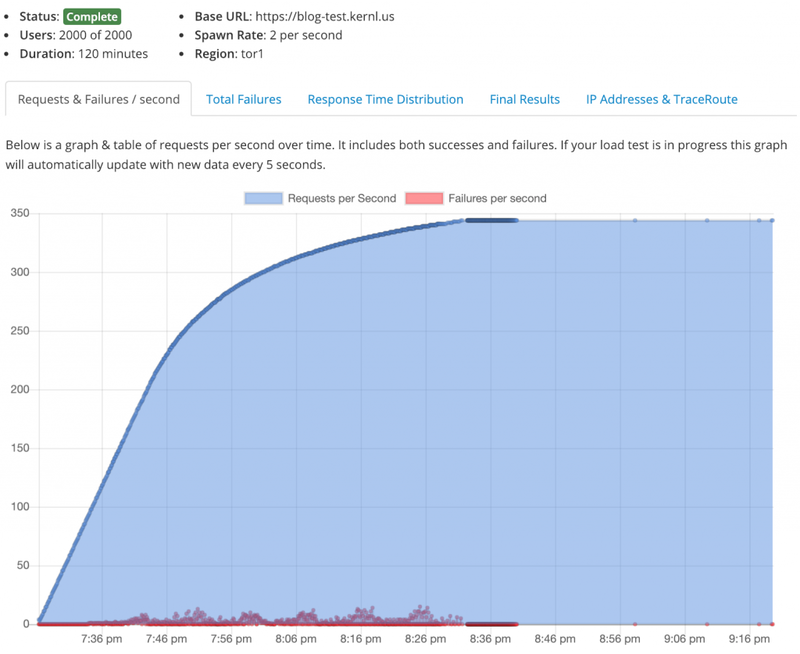 All traffic for this test is generated out of Digital Ocean’s SFO2 data center. What ChemiCloud plan was used? 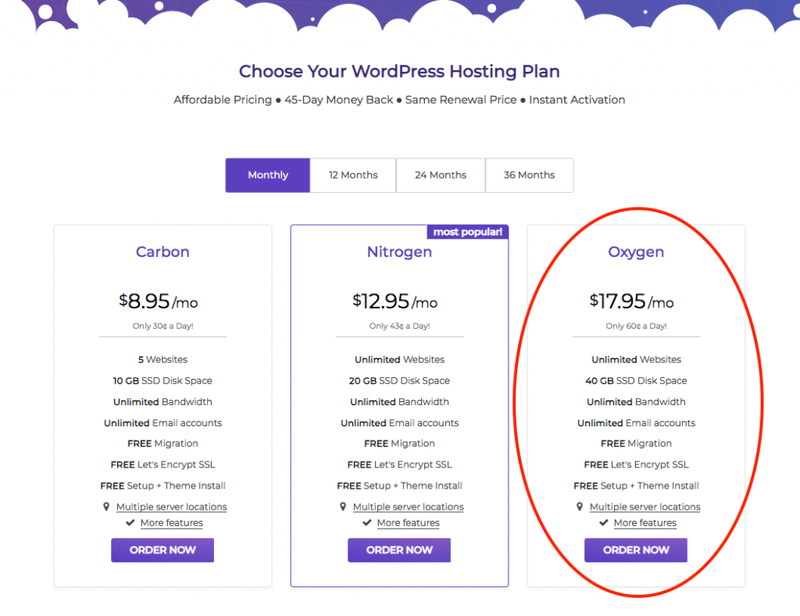 ChemiCloud has several different tiers for managed WordPress hosting. We decided on the “Oxygen” plan. At a high level this seemed to align well with the hosting that we tested thus far. 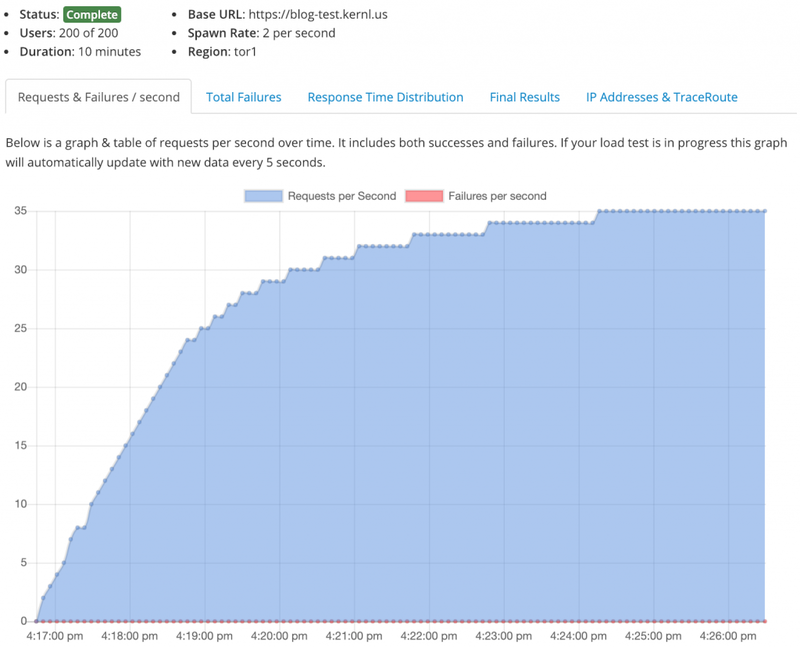 This load test is intentionally simple. It is read heavy. 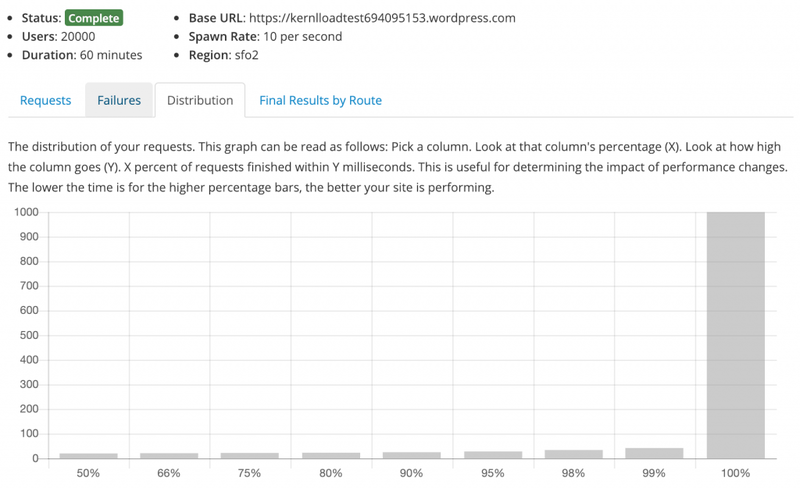 Many WordPress sites have this sort of traffic profile, but not all do. 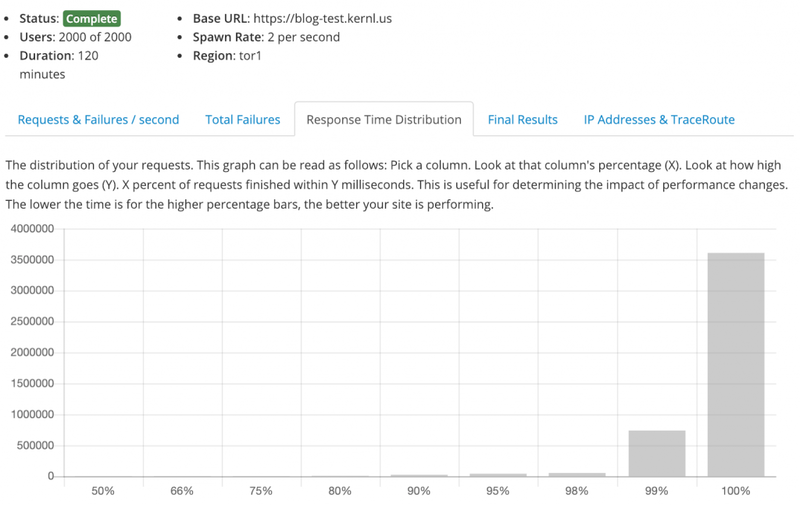 If you need to perform a WordPress load test with a different traffic profile Kernl supports this. Ideally we should also do multiple tests over time to make sure that this test wasn’t an outlier. 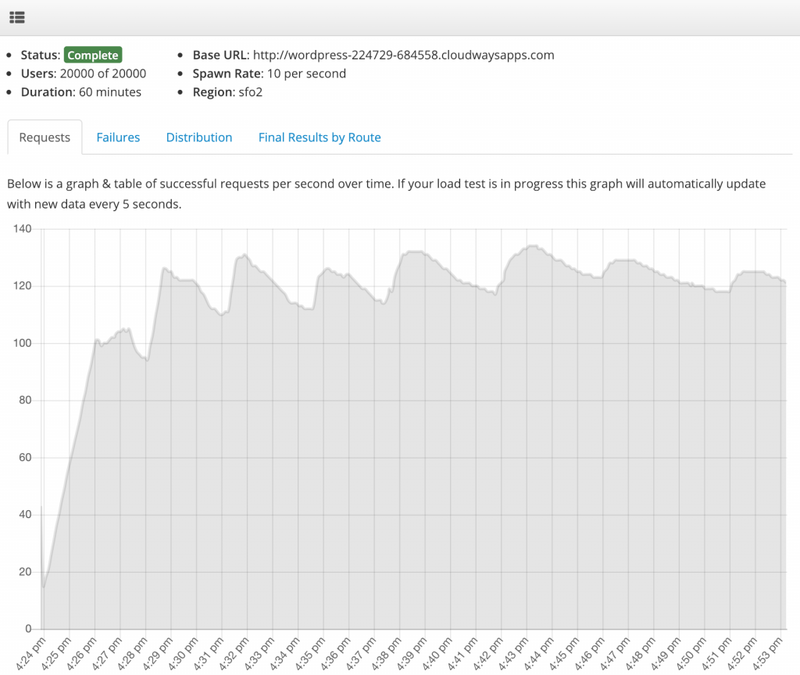 Future load test articles will hopefully include this sort of rigor but for now this test can give you reasonable confidence in how you can expect ChemiCloud to perform under a read-heavy load. 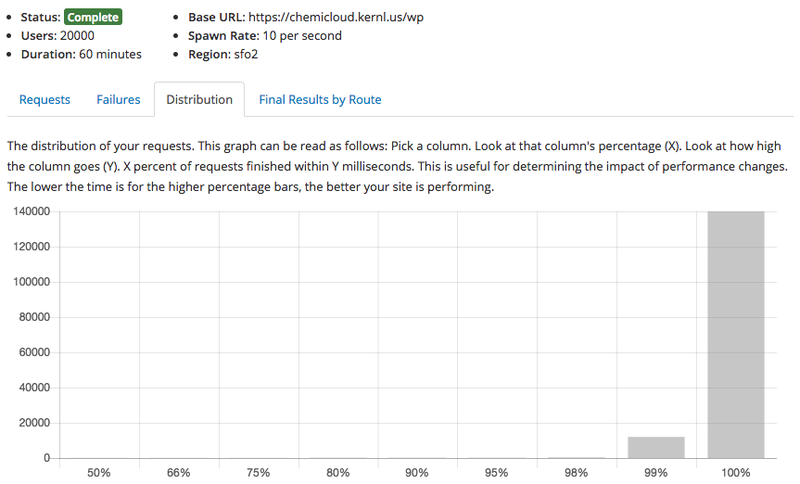 As most of the hosting providers that we test do, ChemiCloud performed well on the baseline test. They settled in at right around 25 requests / second. 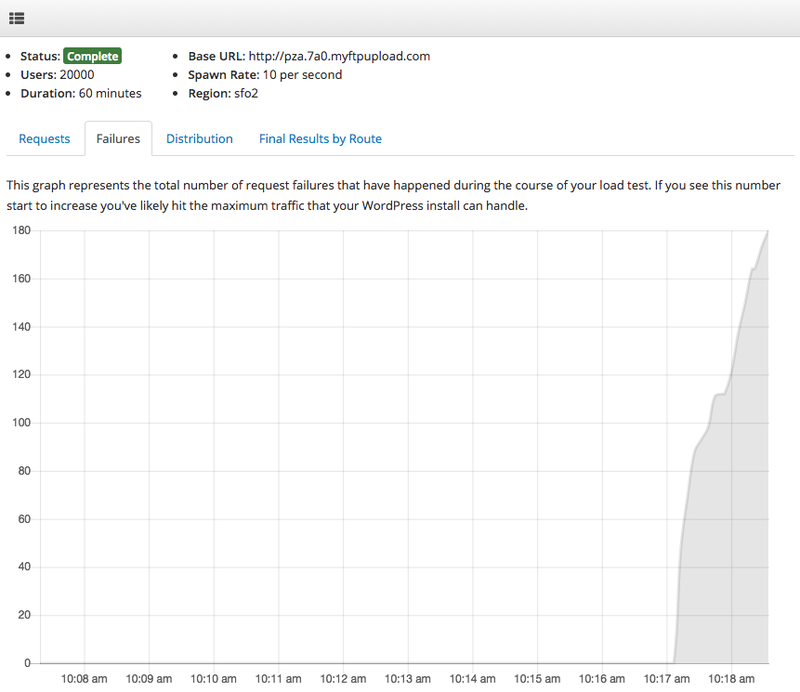 We did see a few failures towards the end of the test, but it appears that it was only a spike. 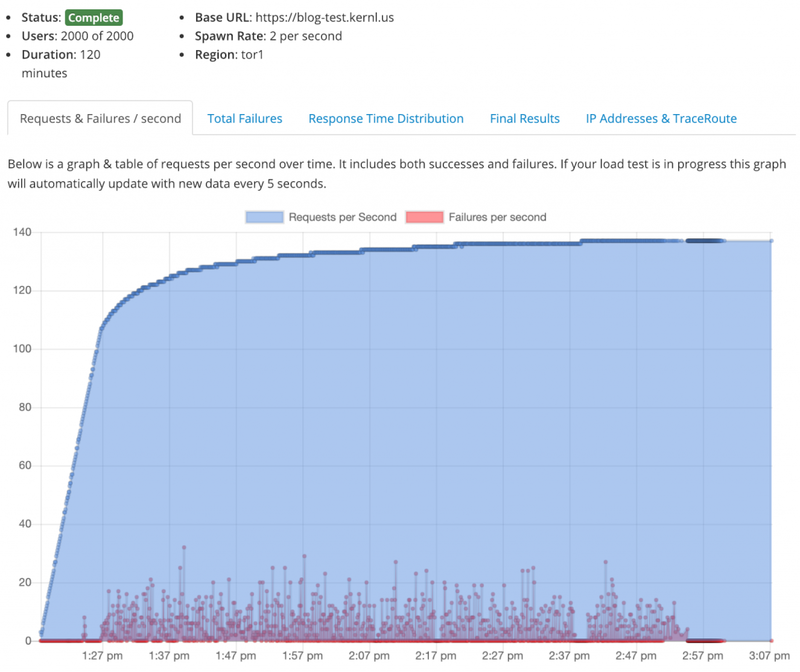 Once the spike passed we didn’t see any more errors for the duration of the test. 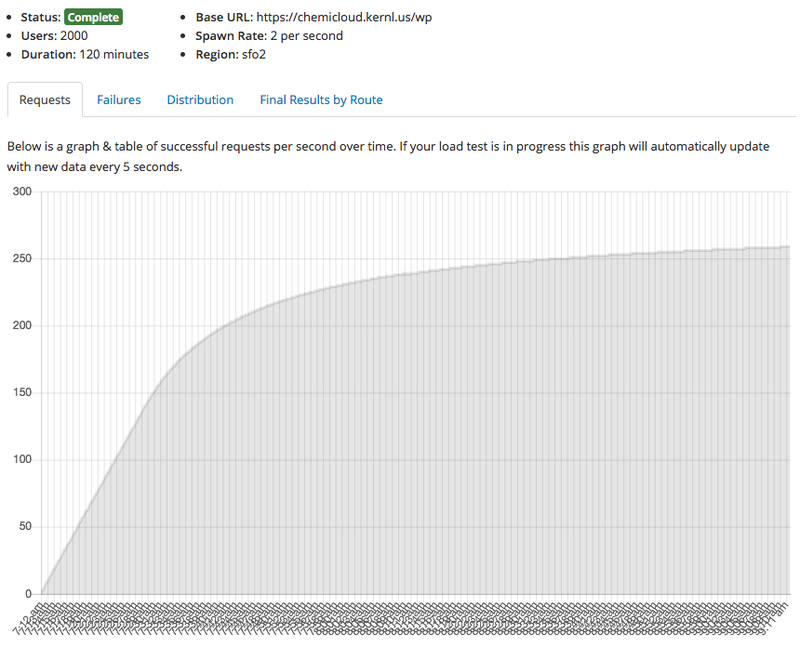 The response time distribution for ChemiCloud was solid for this baseline test. 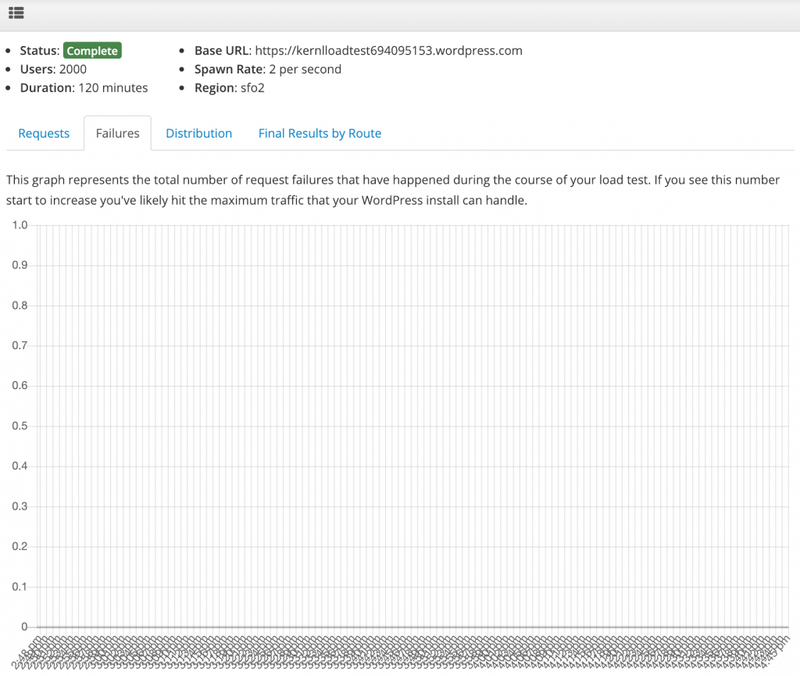 99% of requests finished in 550ms. 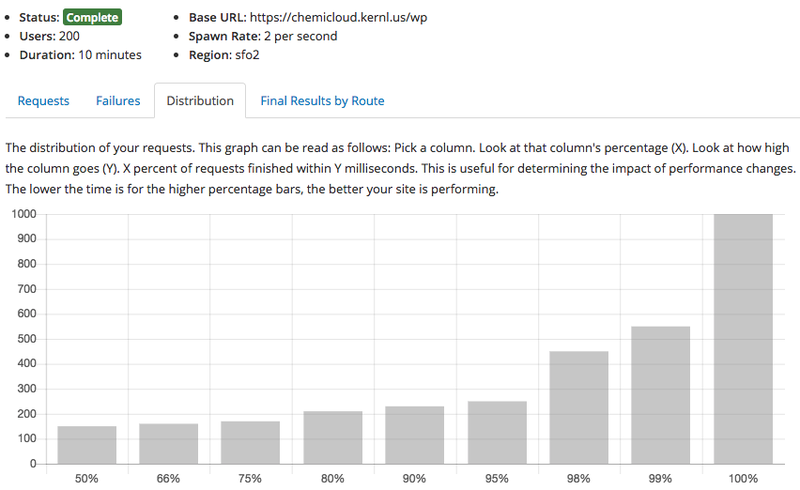 If we go further down the distribution you can see that 95% of requests finished in ~250ms which is quite good. Even the 100% outlier still wasn’t that bad. 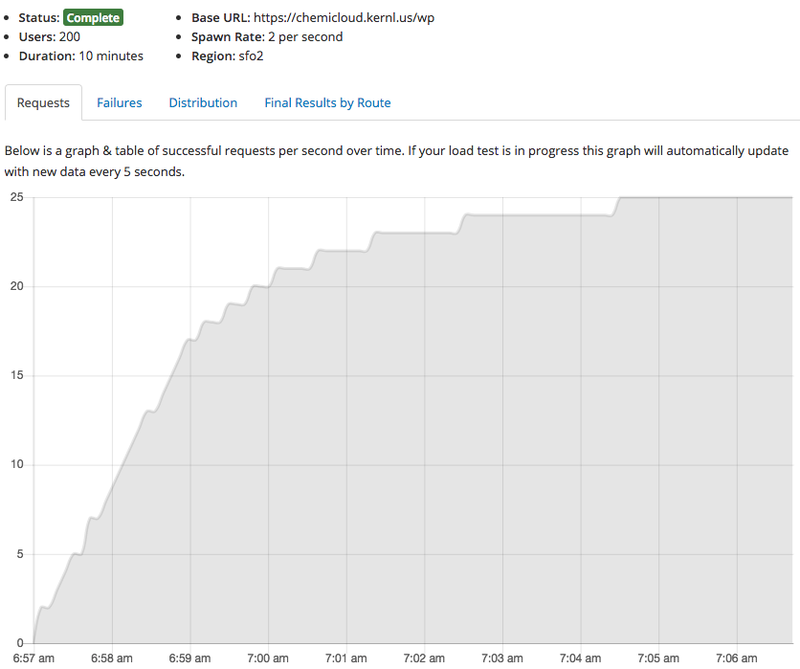 For the sustained traffic test ChemiCloud did a great job serving requests while keeping response times down. 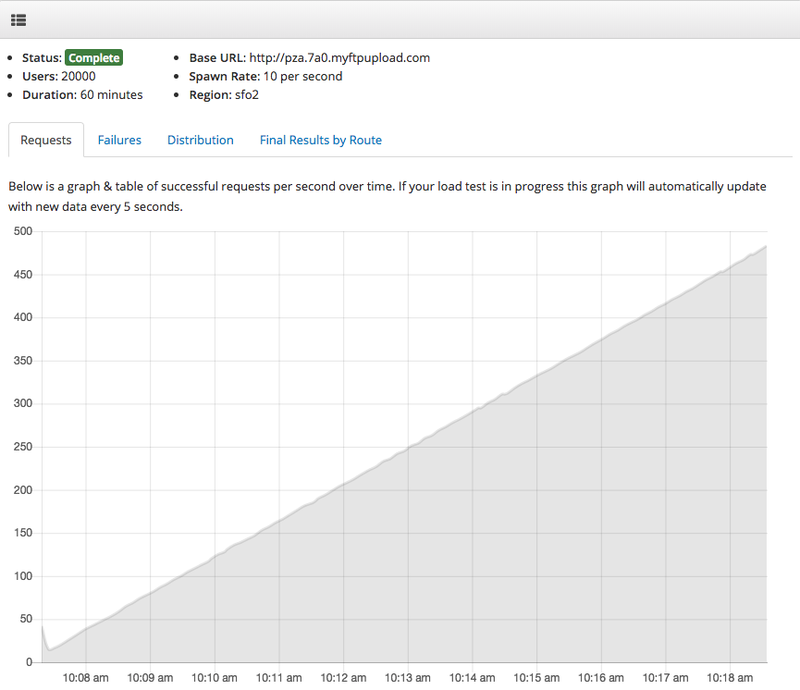 As you can see from the graph below, the test settled in to right around 260 requests / second. The journey to that many users was smooth and there aren’t any surprises on the graph. There were a few failures during the test period, but it appears that they were only a temporary blip. You can see that about half-way through the test we ran into ~32 failures. After that we didn’t see any more for awhile, and then we had one more before not seeing any again for the rest of the test. 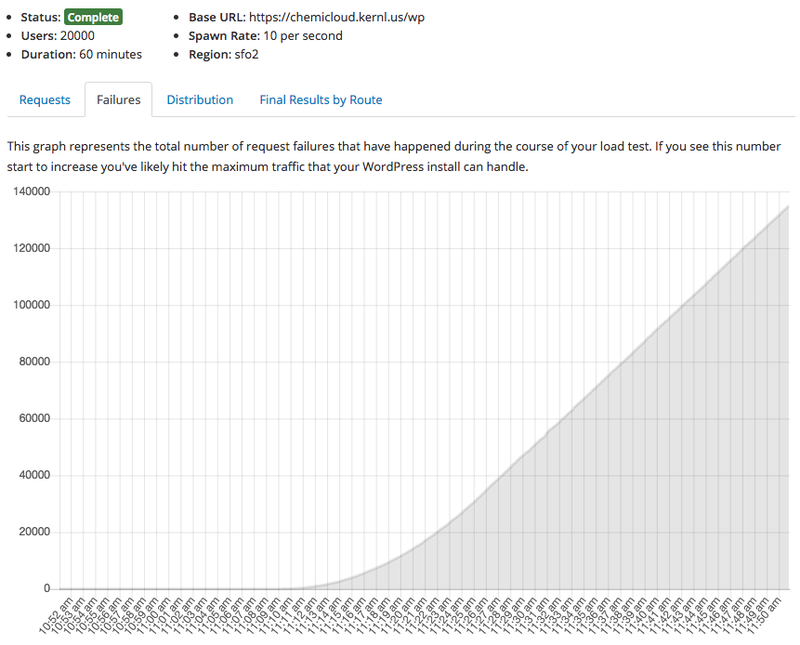 For some perspective, we performed 1,861,230 requests again ChemiCloud and only 33 failed. Thats a failure rate of 0.0017%! Nice work team ChemiCloud. 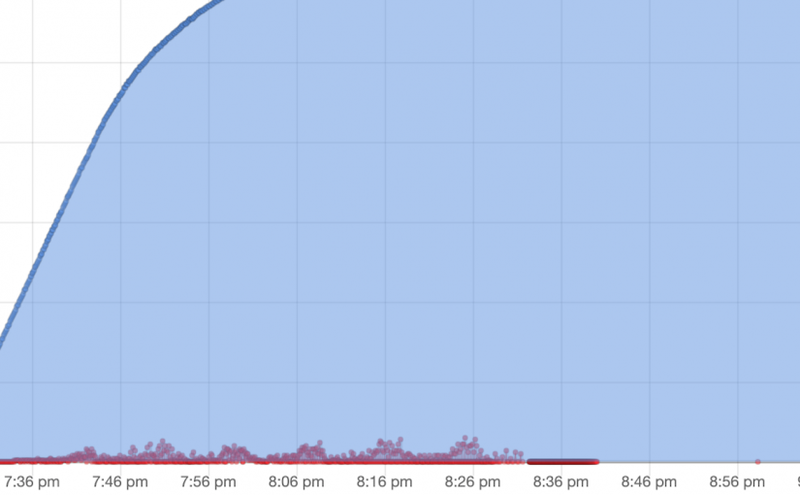 The response time distribution was pretty great for the sustained test as well. 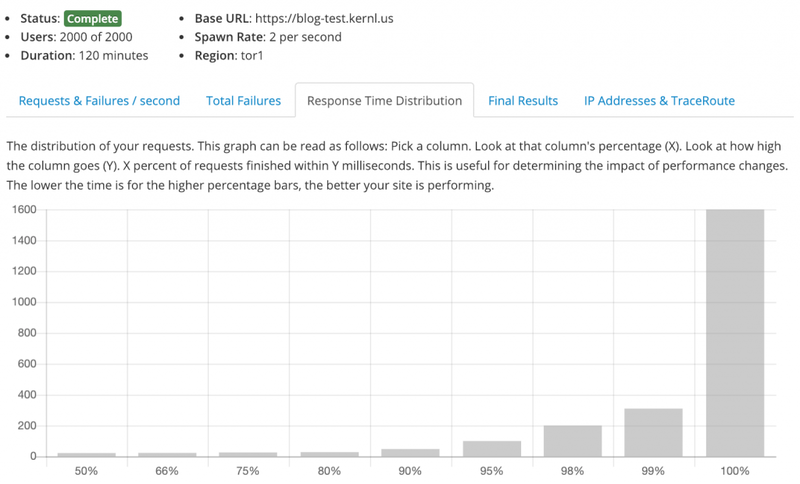 While there was an outlier at 100% (which is common), 99% of requests finished in under 400ms. 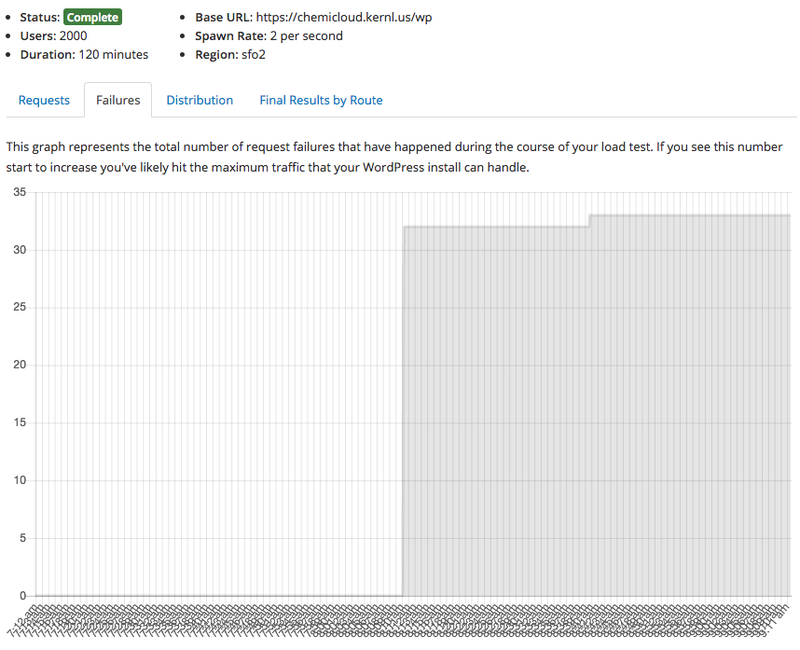 Thats an effort worthy of praise with WordPress! 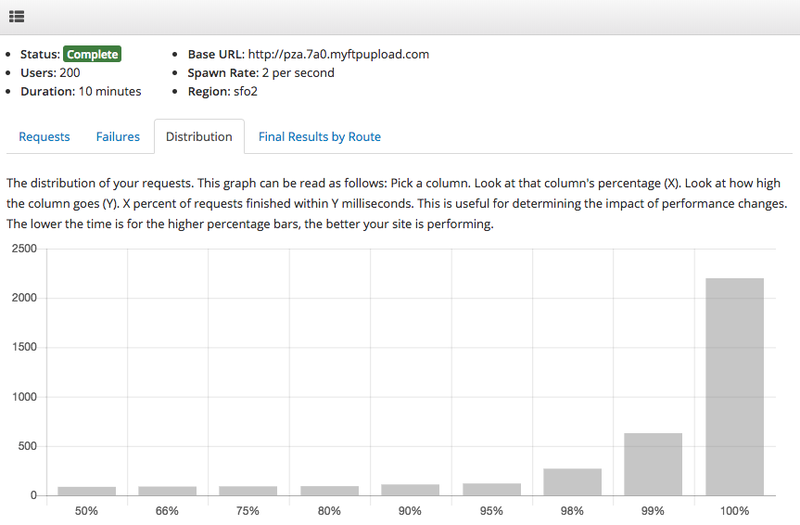 The traffic spike load test is brutal for any host. Nobody ever expects to see this kind of traffic out of nowhere so few are prepared for it. 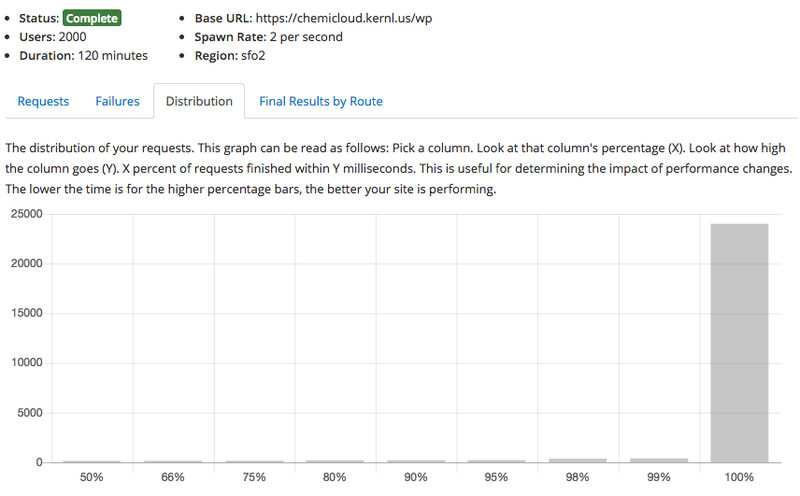 ChemiCloud handled the traffic rather well though. 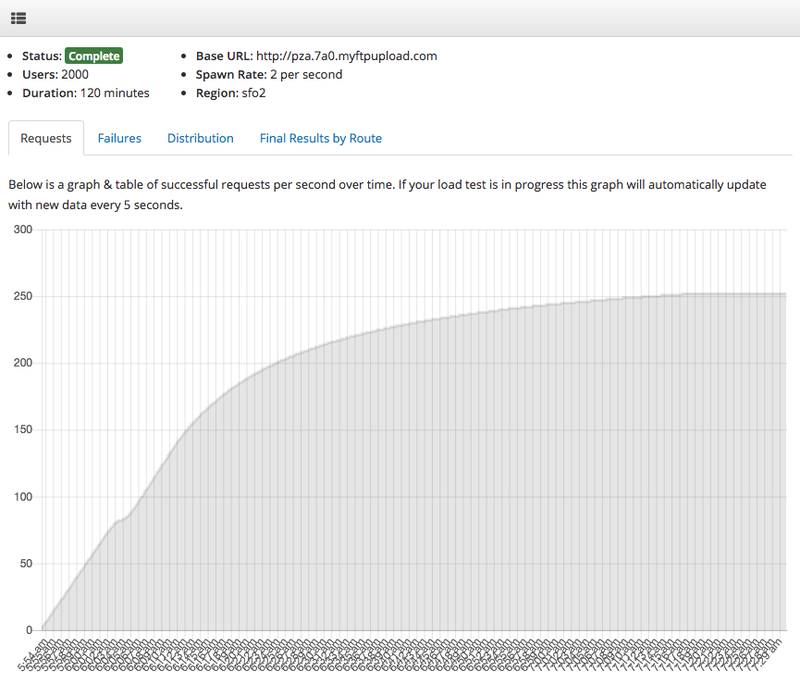 We eventually reached 1200 requests / second which is pretty impressive for a plan that costs $17.95 a month. There weren’t any surprises on the way up to that level of traffic, but as you’ll see we did start to see error rates increase. 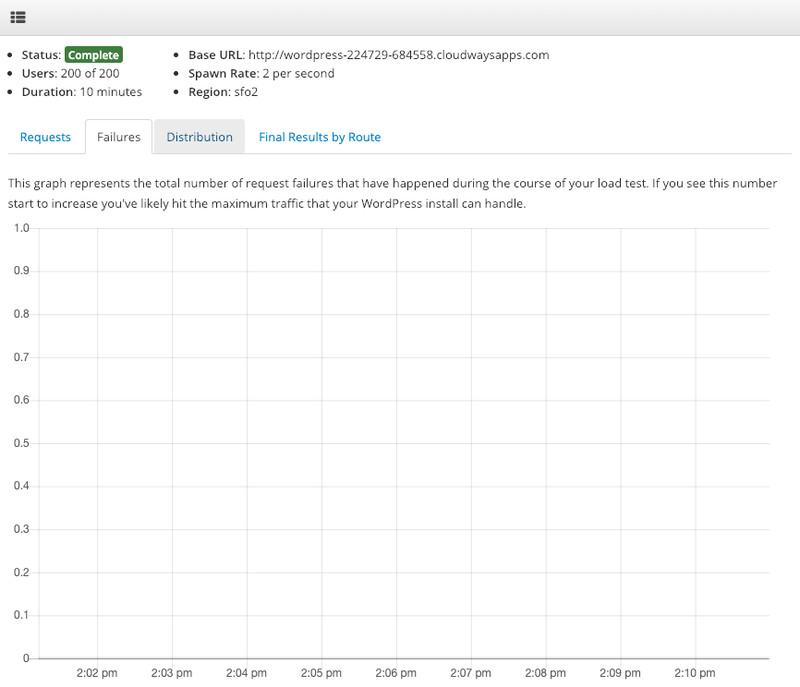 At about 15 minutes into the load test we started to see an uptick in failure rates. 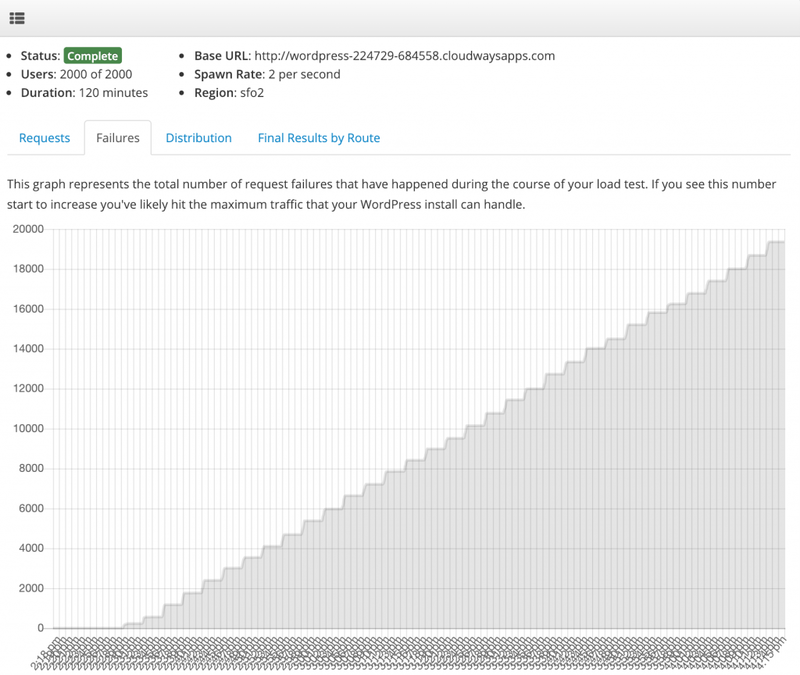 The rate of failure stayed consistent throughout the test after that. 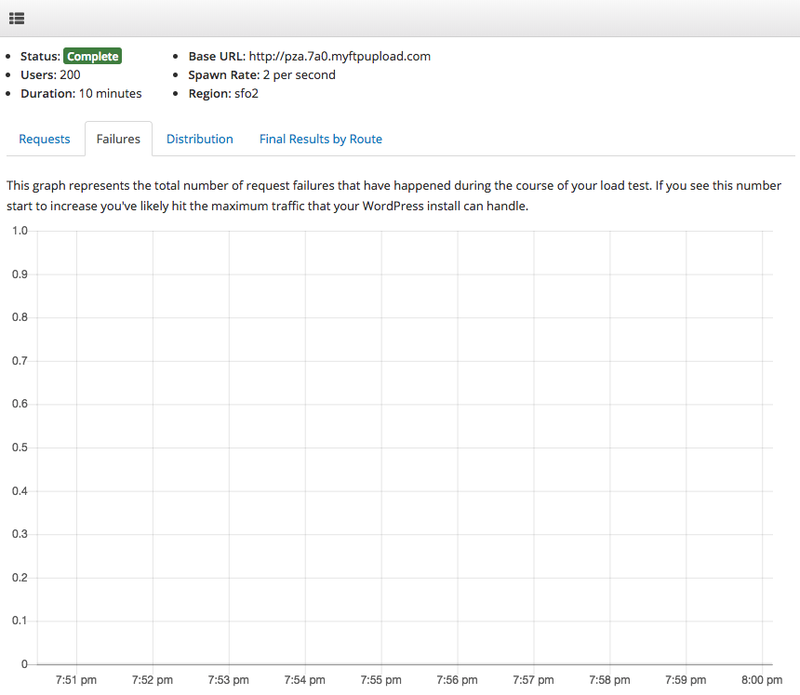 This is a fairly common pattern when hosts become overloaded with traffic. 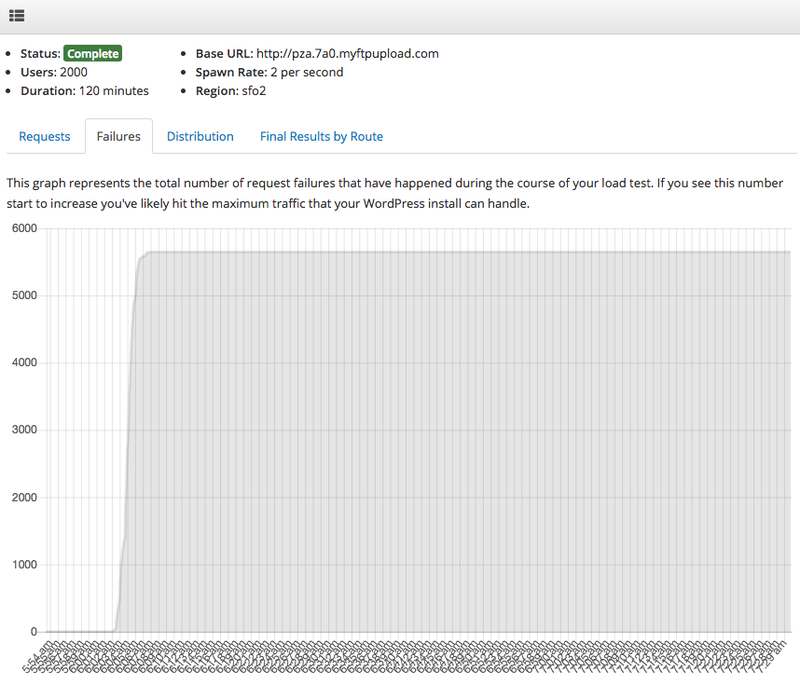 In general ChemiCloud performed well even with these failures. 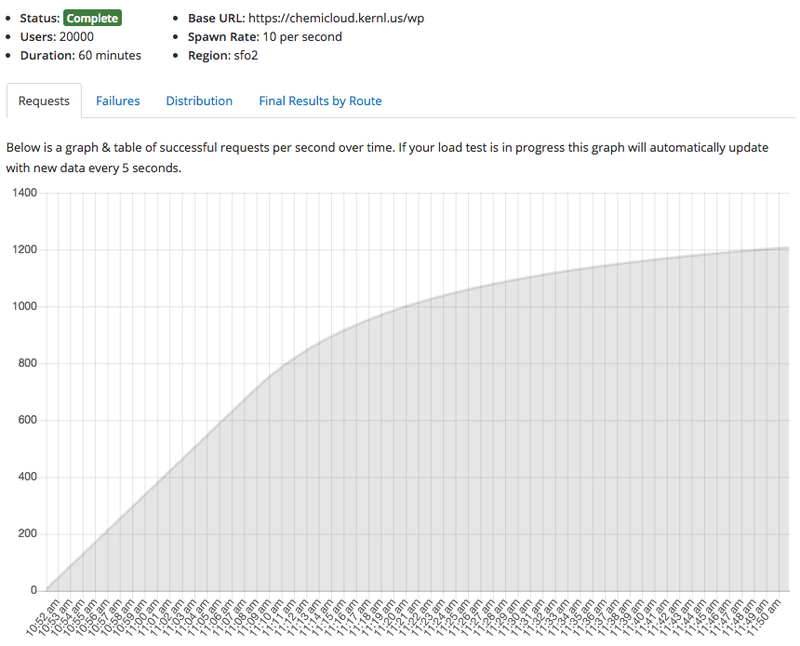 We sent 4,332,244 requests to ChemiCloud over an hour period and 134,893 failed. For this sort of load test a failure rate of 3.1% isn’t bad. 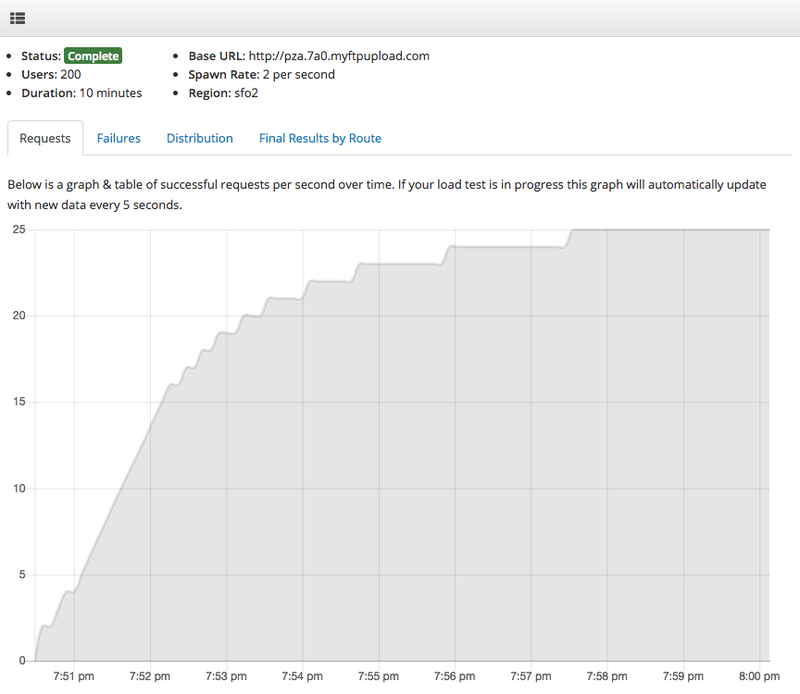 The most interesting graph from this load test was the response time distribution. 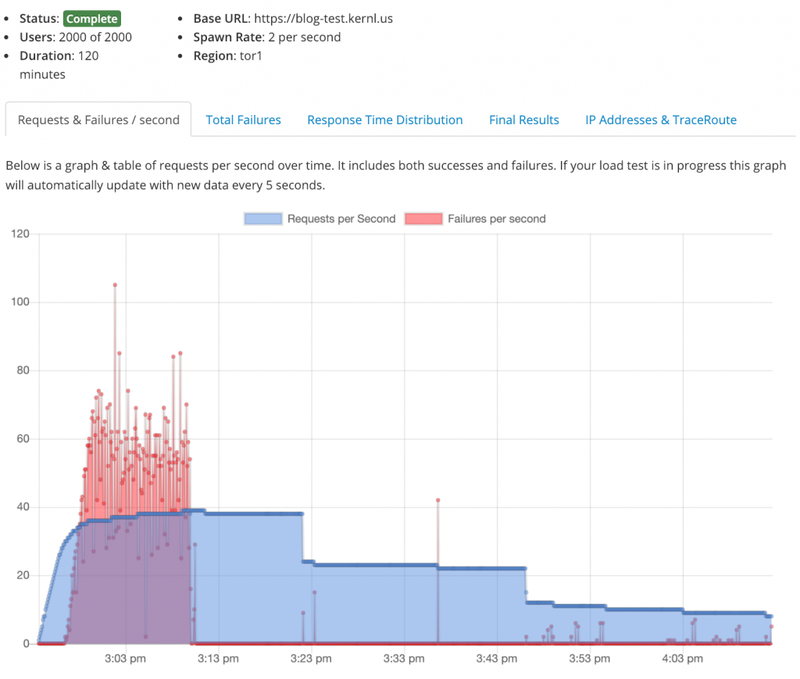 You would expect to see a general degradation of response time performance as request failures increased but that wasn’t the case at all. Everything below the 99th percentile performed remarkably well considering the traffic we threw at it. 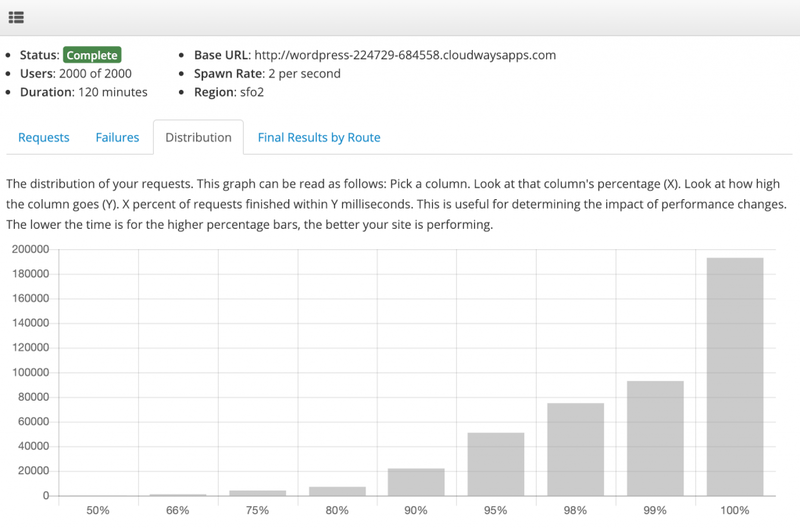 98% of requests finished in under 370ms. Great work! 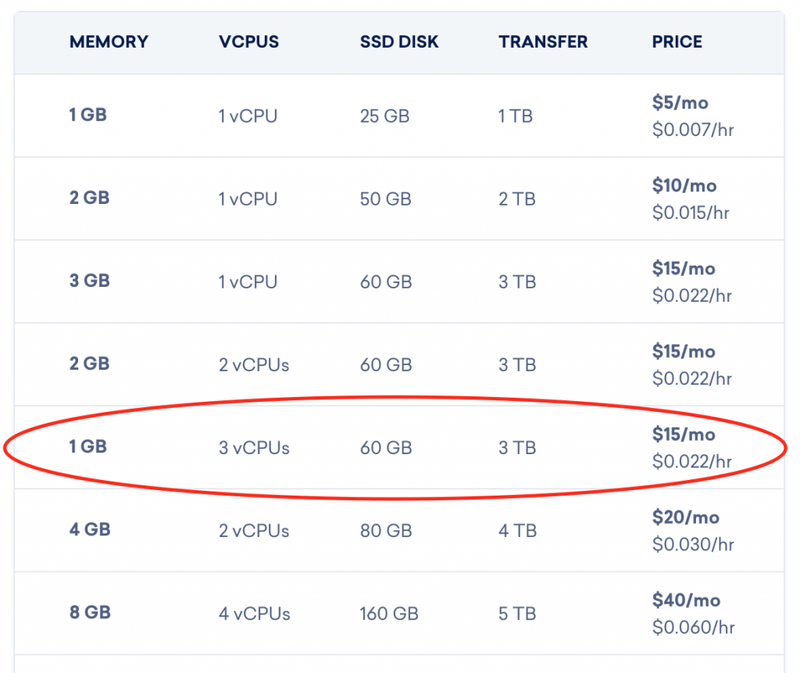 ChemiCloud competes well with the other hosts that we’ve tested. 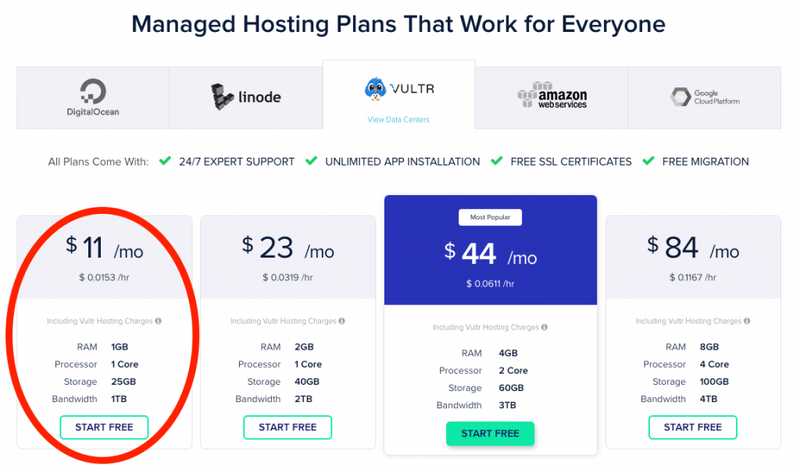 They have a solid price-point and you get a lot of control over your WordPress environment. 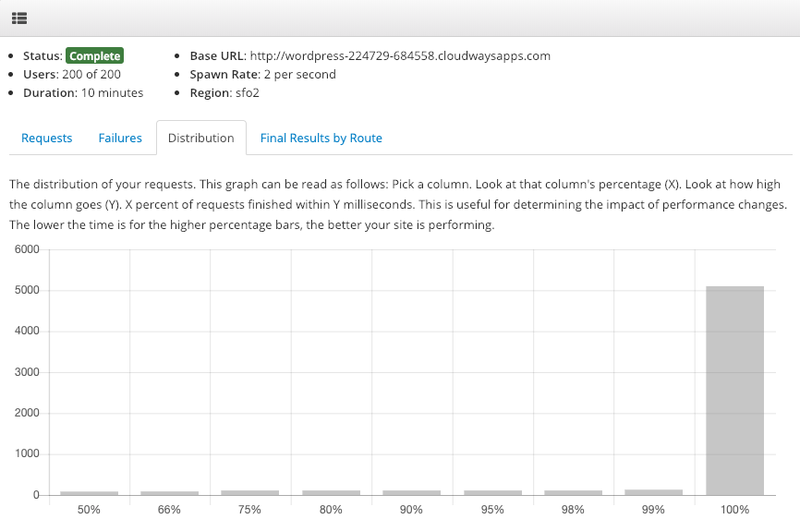 If you need a host that can handle some solid traffic spikes they are a good choice.